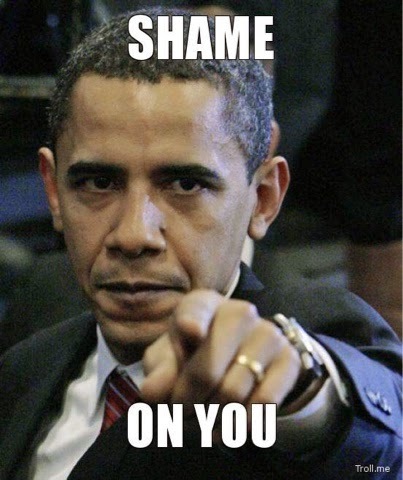 Perhaps one of the hottest topics in social media right now is the concept of shame, and in particular public shaming. Following the publication of Jon Ronson’s excellent book, So You’ve Been Publicly Shamed, there has been a lot of discussion of the way social media (in particular Facebook and Twitter) can be used as a weapon against those that we dislike, disagree with, and ultimately wish to silence. In addition to this, the lack of nuance enforced on us by Twitter's 140 character limit forces us to pile into intense ethical debates on Big Questions (sexism, racism, feminism and social justice) with too strict a construct. How can this be a step forward from Aristotle and Socrates? The problem is this: the concept of shame itself is such a personal one, and we all carry it to a certain degree throughout our lives. None of us are perfect, and this leaves you with many problems when you move into the online world, and start to engage. On social media, everything is geared towards everybody being perfect and right. The parts that we would not like known about ourselves stay hidden. That we can sometimes be rude to parking attendants and waiting staff. That we can be unkind to others at times. We need to present this norm, because it’s so important to us to be seen as a positive personal brand in our online lives, as flows offline, and into people’s minds, forming a perception of us. But let’s face it. What we type into our devices, a lot like telling the bare-bones story of evolution, is only the surface of what we are. So there are great gains to be had in shame, and in shaming others, especially when you are engaged in an argument online. Once someone is shamed by doing something in our minds that we deem to be wrong, it is assumed by crowd consensus that it is okay to wreck this person’s life. It is also assumed fair that they should be tarnished with it forever. That’s my view on how many people see these shaming bouts. The cases of Jonah Lehrer, Lynsey Stone and Justine Sacco stand out when discussing this. Shame has become toxic online. I'm conflicted about it's use. For someone to be shamed, and to remain shamed in perpetuity, for individual acts as Sacco, Lehrer, and now Britt McHenry, when they have committed no serious crime, is a troubling development. Social media is now acting as a kind of kangaroo court, on both the sides of the political spectrum, to not only shame people for doing things that in their mind are rude, but to also attempt to shut down debate around touchy subjects. I've even seen parents shame their children online. There are fewer things less pleasant than seeing that. As I was writing this, two examples sprung to mind. Firstly, my partner works for a hotel in London that is owned by Arab businessmen. As is their right in this country, and in any free country, they would prefer not to handle alcohol or pork products in the business they own. This caused outrage on social media (stoked up by stories in the Daily Mail, including an article by arch-moron Richard Littlejohn), as people (mostly to the far-right of the political spectrum) rushed to condemn the hotel for choosing what they wish to sell. The fallout was hideous, and people were trying to shame the establishment online into changing its mind, by saying that choosing to not serve bacon and beer to people was tantamount to introducing Sharia Law to London. Queries were fielded from people who asked if gay people were still welcome in the hotel (they were, of course), and even if they hotel stated this clearly, it was still inferred that they did not. This is the problem with social media at times - people can make unsubstantiated claims, and are under no immediate pressure to have to prove their assertions. It is nearly *always* assumed that the customer is always right. The customer of Twitter, Facebook, Google+, Tripadvisor or any message board. We are often hear the David vs. Goliath analogy wheeled out when an individual takes on a brand on social media. And the automatic assumption is that the brand is always the bad guy. As always, the answer is a lot more nuanced than that. And yet the burden of proof is always on the brand - and it's much easier to call a brand a liar on Twitter than a person, isn't it? 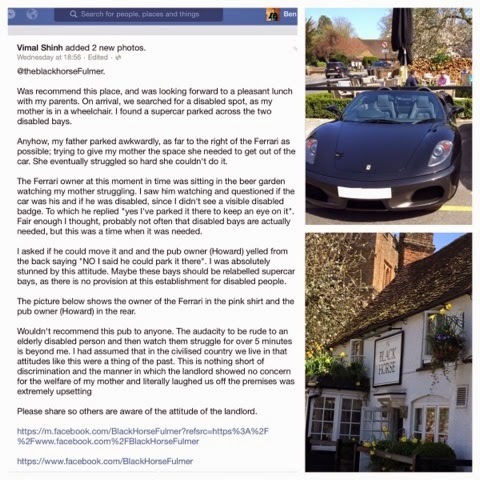 This week, for example, when I was checking Facebook, I came across this post about a pub in Fulmer, and it's owner, who allegedly denied somebody a disabled parking space to allow a Ferrari driver to keep his car in sight from the beer garden. My initial gut response to this was disgust that a business and another person could treat somebody with a disability in this way. And then I clicked on the link. And I started to wonder: is the story true? As far as I know, according to one side of the story, it is. But watching the pile-on in the comments section of people (mainly from the left of the political spectrum, for balance) using their guts before engaging their heads, of the threats of ruining somebodies business without first asking the pub in question if this did in fact happen, made me worried. Do we really need so little evidence to start judging people online? Have we really fostered a platform where anybody at any time can set about either shaming an individual or a brand without anybody checking the provenance of the claims? It's made me realise why we have laws. It's to protect us from the worst of the damage we inflict upon ourselves as a society. Laws are there to protect us, and they're also there to protect people who are, at times, arseholes. Massive, honking, banter-loving, denim-clad, arseholes. Makes you sick, doesn't it? It does me. But I wouldn't give that up. It would be bad for all of us. Which is why I think shaming on social media is bad for us as a society. An eye for an eye leaves the whole world blind, and with social media, often we are left fumbling in the darkness. And one day, fumbling around in the darkness, we may end up making this Clickhole headline into a reality. And that would be a reason for all us all to feel ashamed. Make no mistake about it, being stuck in the middle of a social media crisis is no joke. One misplaced comment, one ill-advised product launch, one badly-timed or insensitive message can potentially derail years of hard work on building a brand or individual’s credibility. Suddenly, social media is no longer a representation of the world around us - it’s a tidal wave of fury, criticism, negative blog posts and biting jibes. Whether it’s justified or not, it is what it is. It’s like you've invoked an ancient, multi-headed, pitchfork-wielding Hellbeast that types at the speed of light, and when you’re caught in the headlights, it can really, really play havoc with your brain. With that in mind, I’ve decided that, rather than putting together a practical guide to avoiding social media crisis, or planning for one, I’ve decided to put together a six-point list of things you can do to avoid burning out during one. I can guarantee that at some point in your career, you will be faced with a social media crisis. Here are six tips to storm-proof your brain and your soul, as well as your brand, during a social media crisis. 1. Be prepared: the old adage is true - Prior Planning Prevents Piss-Poor Performance. From my experience, even in the fastest-developing social media crises, you need to formulate a plan. Play Devils Advocate, and think of every single piece of negative feedback your fans and followers could throw at you, and formulate a response to them before the event, so that you have notes and updates that you can share with people when they feedback to you. Next, ensure that your team are fully-briefed. As a manager or social media lead, you need everybody to be plugged into your knowledge. This will help when it comes to point five on this list, so keep it in mind. Start up a Google Doc of suggested responses (not canned responses - writing them out individually may be a chore, but believe me, people know when you've sent them a boilerplate holding message or response. Don't treat your audience like idiots). If you don't, you could find yourself in the middle of a type-1 shitstorm. 2. Keep Calm: As Social Media Manager, people will be looking to you to provide clarity, insight and guidance in the middle of a crisis. What they don't want to see is some red-faced, arms-aloft goon waving his or her arms around and shouting at the screen. It's going to be stressful: we know that. But no matter how bad it gets, and how quickly the messages roll in, remember that you are the social media professional. You know how to navigate this, and your company need to trust you to guide their customers and their reputation through any social media crisis. Take deep breaths. Remember that you are the professional. Remember that most of the time, the customers don't see you as a human - they see you as the brand. They are not having a pop at you personally, so remove that from the equation - a challenge in itself, but keep telling yourself that it's not you they're mad at, or calling names. Keep your management in the loop at all times. Update honestly, and tell them whether the news is good or awful. You owe them that, and that's what you're hired to do. Be the asset your company hired you to be, and trust yourself. Be the beacon of light in your team. Be the person who greets people during the crisis with a smile. Crack jokes to kill the tension. Remember that, above all, that this may be a job, but you spend more time with the individuals here than you do at times with your nearest and dearest. So treat them with care and respect, and try and make their day a little better whenever you can. 4. Look after yourself: When things are tough at work, and Twitter, Facebook and even Pinterest seem to be ablaze with negative feedback, remember to know when to look away. Remember to still take regular eye-breaks. Get at least 15 minutes of fresh air every couple of hours. You can take your phone or tablet with you can't leave your work behind, but make sure you walk, keep the blood flowing, and keep the air fresh in your lungs. It will make a difference, I promise you. 5. Your downtime is as important as your work time: Nobody can be a 24/7 social media automaton. You need food, sleep, family, external stimulation and exercise to remain sharp and focussed when you are in work. So know when to switch off, and make sure that you do switch off. Deep into a social media crisis, make sure that you have a shift or buddy system sorted, so that you are not wracked with anxiety if you think something may happen when you are not at work. Use that time to do things that YOU want to do. Do not check your emails, phone or social media accounts. Things are being dealt with by your shift-buddy. You can just focus on being good to yourself. Spend time with your loved ones. Go for a walk. Go to the gym. Play football. Play games. Eat out. SLEEP. This is not selfish - it is self-preservation. You cannot be an effective social media professional if you are burning the candle at both ends from a work perspective. You will become a drone. You will make mistakes. People will get pissed at you both at work, and at home, and with good reason. If you can't look after yourself, how can you be expected to look after other things? Self-care is paramount. Remember this. PLEASE. 6. This too shall pass: Remember #HasJustineLandedYet? What about #susanalbumparty? What about #hmvXFactorFiring? #PricelessSurprises? No? You probably forgot - they were all well over two weeks ago, which is ancient history on social media. The one good thing about a social media crisis is that it can literally be here today, gone in an hour. It's like rain. It can be heavy, light, patchy or torrential, and can last anywhere between two seconds and, in Noah's case, a really long time. But it does stop. And it will pass. The sun will come out (tomorrow, tomorrow...), and you will be able to go back to something like normality at some point in the future. You will have a quiet day again. I promise you. You just need to weather the storm, and remember that this is an amazing learning experience! It's not every day you get caught up in a social media crisis - what have you learned from it? Write down what you and the business have learned from the situation. I bet it's a lot. All of what you have been through in a social media crisis can be applied in other aspects of your role. Remember, you are guiding your followers, and your business, through this crisis. Take notes, take feedback, and share what you have learned. Make sure that your social media crisis wasn't for nothing. Make sure you and the business you work for come out of the other end stronger and more robust. A good social media crisis can break you, but it can also MAKE you. Trust me on that one. I've seen a few. Do you have any tips that you'd like to share? What self-care tips do you have for people and businesses going through a social media crisis? Share them below.